So I’ve had more than 400 Eternity Splinters burning a hole in my inventory for a while now, and haven’t been able to decide on which character to buy. Magneto? Seems too much like the AoE nuker classes I’ve been favoring a little too much lately, and I’m looking for something different. Rocket Racoon? I was pretty close to picking him up, but then I heard his summons got a big nerf, so that was a turnoff. Cyclops? Everyone says you should at least level him to 50 for the XP bonus synergy, but they also say he’s really boring. I could go on, but you get the idea. So the other night I was bored and started messing around with a few of the classes I haven’t tried with the new “every character is free up to level 10” feature they added a while back. For some reason, I tried out She-Hulk, because, while I’m a little put off by Marvel’s proclivity toward making female versions of every super hero, come on, she’s way cooler than the original Hulk. Not as strong perhaps, but how cool is it that she’s a green superhero lawyer? Not to mention all of the legal puns involved. After about 15 minutes of playing her I knew I had to buy the unlock. I just fell in love with her playstyle; stomping around and punching baddies to build up combo points, then spending them on one high-powered AoE slam to finish them off. I really like how some skills require zero combo points to be at full power, and others require–but don’t use up–full combo points. She also has a refreshing way of doing melee, a playstyle that I generally don’t like in this game (I have both Thor and Wolverine, and both got boring really fast) by giving her a variety of powers that make her leap into the fray. Plus her “Objection!” skill makes her lob a briefcase full of legal documents at her enemies. What’s not to love? 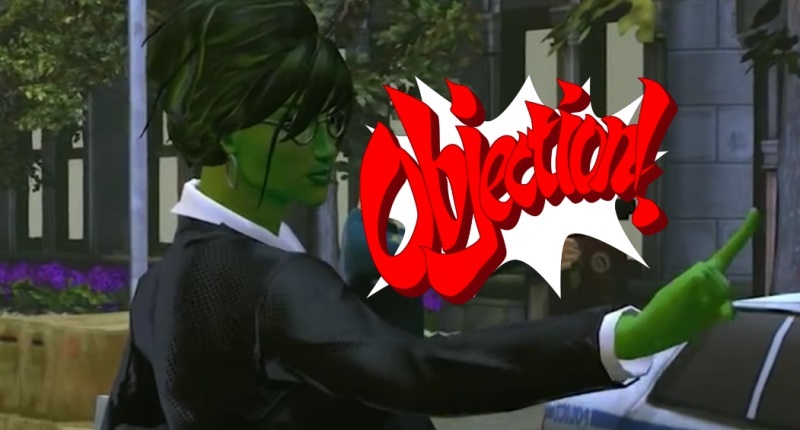 Forget sweatpants Hawkeye; make a $15 Phoenix Wright costume for She-Hulk and you’ll make millions. Long story short, I got her to level 25 Friday night alone, which is a leveling speed record for me. I had planned to play WildStar that night, but couldn’t tear myself away from Marvel Heroes. I’m also seriously considering buying her lawyer outfit next time there’s a costume sale, because I think it’s a lot cooler than the weird swimsuit thing she comes with. Considering that I’ve bought a grand total of one costume up to this point, that’s saying something. If you had told me when Marvel Heroes came out that my favorite characters would be people like Squirrel Girl, and She-Hulk, I probably would have thought it was some kind of joke, because I would have been completely unaware of the existence of any of those heroes if not for Marvel Heroes. That’s one of my favorite things about the game; it exposes non comic readers like me to some of the more obscure heroes and villains of the Marvelverse that will likely never make it into the movies.